The second-newest imprint in Amazon Publishing’s portfolio offers both audio and ebook editions of works brought together in thematic collections. The first was released during BookExpo in New York City. 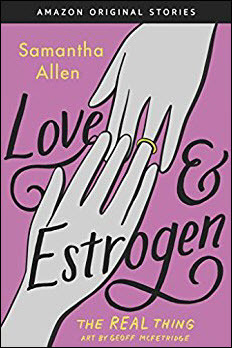 As Publishing Perspectives announced in November, the 14th imprint of Amazon Publishing is called Amazon Original Stories, and has been followed to date by the addition of a 15th imprint, Topple Books with filmmaker Jill Soloway. It seems now that the imprint is thinking about those who might want more than one sitting at a time: it’s rolling out collections. Its first collection was released during BookExpo, and the formula is going to be repeated in the future with themes of climate-inspired fiction, nightmares, and more. The slight branding collision anticipated is in place: the Original Stories banner lies on the Kindle Singles page. Julie Sommerfeld, who’s the chief of Kindle Singles, is also editorial director of Amazon Original Stories, so this is the same shop at work. Overall, though, it might help for the company to devise some more easily differentiated sub-brands and imprint names when such evolutionary paths as Shorts-to-Singles-to-Stories develop, although customers, of course, may be less bedeviled by these thin-sliced distinctions than industry observers are. 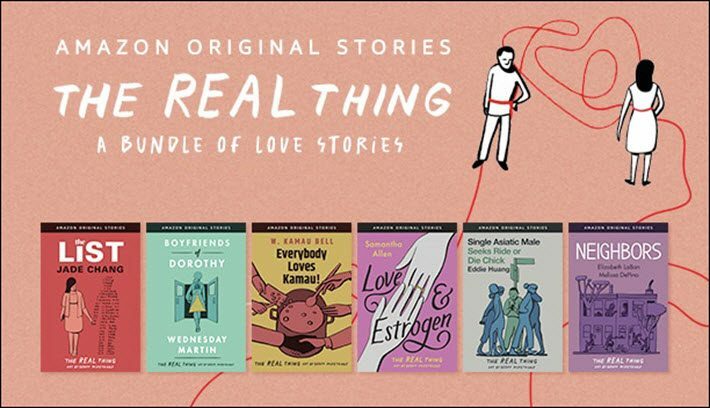 The first collection of Amazon Original Stories is called The Real Thing: A Bundle of Love Stories, and it makes a helpfully coherent example of the concept for Original Stories. The “bundle” has six works in it, each of which comes bundled, in fact, with both a textual and audio edition. That audio component may prove tricky to replicate in all future “bundlings,” in that this first outing, the authors are narrating the audio editions of the stories. 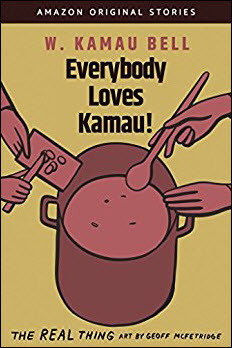 When someone like CNN’s W. Kamau Bell is your author, you’re in good shape for narration. All authors aren’t equally capable of oral delivery, of course. In the case of an upcoming collection, the work will be voiced by a narrator other than the author. The structural concept of Original Stories should be fairly consistent, according to press materials. There’s a theme for each collection, the company says, and the stories in that collection will deliver “divergent points of view on the same idea.” A collection will have its own page. (This release has its page here.) The material is downloadable in a single click for the whole collection or by selecting individual stories. Artwork seems to be unified for a given collection. In this case, illustrator Geoff McFetridge is behind the imagery for The Real Thing. Collections are to have animations at times that will be visible on Amazon Fire tablets and the Kindle apps for Android and iOS—a feature of the Kindle in Motion technology we wrote about at the time author Patricia Cornwell took her Jack the Ripper material to Amazon to take advantage of this approach. And part of the plan includes content development for Prime and the Kindle Unlimited subscription, members of which will get entire collections free of charge in both ebook and digital audiobook formats. The next collection to be released by Amazon Original Stories is called Bloodlands and is described as “a history of the United States told through six forgotten murders from the colonial era to today”—which might prove to be a more sophisticated-thematic approach, perhaps, than “a bundle of love stories.” Bloodlands is expected later this month. That one is apparently written entirely by one author, Harold Schecter, to be narrated by Steven Weber. The collections are available to non-Prime or -Kindle Unlimited members at $1.99 per story or $5.99 per collection.